With Spring in the air, it feels appropriate to celebrate calendula, also known as Herbal Sunshine. 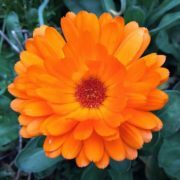 Calendula is a great herb for spring detoxification as well as warm-weather skin conditions & first aid. Properties & Uses: Calendula brings warmth & light to cold & stagnant places in the body, for the “places where the sun don’t shine” (Chris Hafner, acupuncturist). As a lymphatic herb, Calendula maintains balance in fluid metabolism by clearing stagnation, keeping the channels of elimination open and detoxifying. This helps to keep pathogenic bacteria at bay. Calendula is also antiseptic and vulnerary (speeds tissue repair), making it especially useful in purulent wounds, slow-to-heal wounds, and “swollen, hot, painful, pus-filled tissue” (Matthew Wood). All of these are conditions of damp heat, usually the result of stagnation or coldness in the tissue. Calendula has a soothing, anti-inflammatory quality, reducing itchiness and irritation. It is a valuable remedy for inflammations external and internal in the GI tract. As an alterative, it supports immune function by cleansing the blood of lymphatic congestion & lingering infections. Its warming qualities promote sweating, thin fluids and warm the stomach/solar plexus (Matthew Wood). Calendula is best suited for cold, damp, Kapha conditions & constitutions. Contraindications: avoid large amounts during pregnancy due to emmenagogue action; not appropriate for signs of excess heat/ for hot/fiery constitutions. Preparation & Dosage: Infusion- 1 ounce of flowers to 1 quart of boiling water; drink 2 cups a day or use externally as a local application. Tincture- 1-4 ml three times a day. Topical preparations include fresh plant poultices or infused oil. Infused oil can be used neat or turned into lotions & salves.